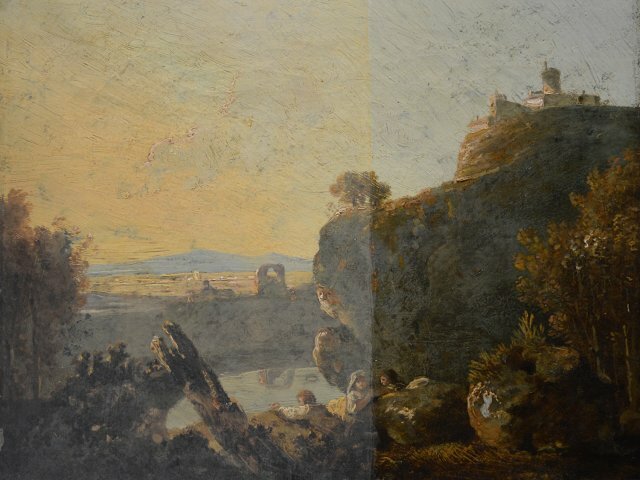 Half of this oil painting by Richard Wilson has been cleaned. (THOUSAND OAKS, Calif. – Dec. 7, 2018) An exhibit about the investigations of art detectives will provide hands-on experiences for California Lutheran University chemistry students and the public. Presented in partnership with Cal Lutheran’s Chemistry Department, “Traces: Revealing Secrets in Art and History” will run through Feb. 21 in the William Rolland Gallery of Art on the Thousand Oaks campus. Katherine Hoffmann, the John Stauffer Professor of Analytical Chemistry, worked with university curator Rachel T. Schmid to put together the exhibit. The display will be a focal point for a new “Chemical Investigations of Art” class that Hoffmann and Robert Dion, an adjunct professor of chemistry, will teach starting in January. Many artworks have been purposefully manipulated or altered by time. Today, scientific techniques allow us to uncover forgeries, predict aging, attribute work to a specific artist, preserve ailing pieces and restore works closer to their original states. “Traces” offers an inside look at the methods used by art detectives to reveal the secrets of artworks, ranging from X-rays and infrared light to solvents that remove varnish. Visitors can compare before and after images, try to identify what has been altered in a work and use ultraviolet light to detect changes. The idea for “Traces” came out of a talk that Schmid gave two years ago to faculty about how to organize an exhibit tied to a course. Hoffmann and Dion were in the early stages of planning the new upper division chemistry course at the time. The class will cover conservation, restoration, detecting fraud and the instruments that enable people to explore the layers of chemical information in paintings, mosaics, sculptures and other artworks. “This type of work is the foundation of, for example, the Getty Research Institute and the Fine Art Conservation Laboratories in Santa Barbara, and is a wonderful career option for chemists with a love for art,” Hoffmann said. The class will meet several times in the Rolland Gallery for the first month for active-learning projects to immerse the students in the application of this kind of chemistry. After the exhibit closes, they will take part in hands-on activities to learn how scientists clean artworks and choose instruments for investigations, research case studies such as the “Blue Boy” restoration at the Huntington Art Gallery, and take a field trip to the Getty Research Institute. Admission to the exhibit is free. The gallery, located in William Rolland Stadium, is open from 10 a.m. to 4 p.m. Tuesday through Friday and 11 a.m. to 3 p.m. Saturday. For more information, contact Schmid at 805-493-3697 or rollandgallery@callutheran.edu or visit CalLutheran.edu/Rolland.